strict warning: Declaration of views_handler_filter_boolean_operator::value_validate() should be compatible with views_handler_filter::value_validate($form, &$form_state) in /home/midwales/public_html/sites/all/modules/views/handlers/views_handler_filter_boolean_operator.inc on line 0.
strict warning: Declaration of views_plugin_style_default::options() should be compatible with views_object::options() in /home/midwales/public_html/sites/all/modules/views/plugins/views_plugin_style_default.inc on line 0. New DVSA Authoristed Tachograph Centre is now opened at Unit 3 Glanyrafon Industrial Estate, Llanbadarn Fawr, Aberystwyth, SY23 3JQ - please contact us on 01970 828288 - or pop into our New Depot. We had great pleasure in recently carrying St David's Cathedral Choir who toured Normandy and sang in a number of Churches/Catherdal whilst on tour. Our services will not be running on any Bank Holiday Fridays, Sundays or Mondays - Saturday service will run as normal. Students can now travel to Cardiff at a Student discount rate with our MWT Card on the 701 Service (Blue Bus) as from today. The MWT Cards can be purchased at the Aberystwyth Guild of Students Reception at a price of £65.00. Mid Wales Travel 03 Service will be starting on 13th September 2012. Huw Lewis, Assembly Member will be opening this service. Mid Wales Travel have also new services 301, 302, 304, 305 which will be starting on 24th September 2012. Click on the Public Bus Service. 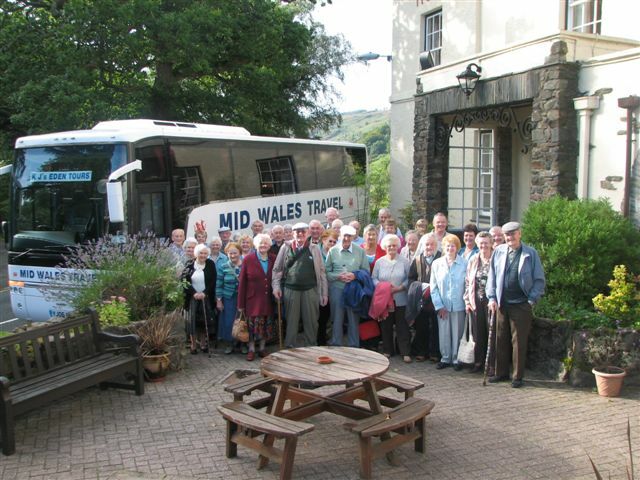 Eden Tours Party outside The Royal Goat Hotel, Beddgelert enjoying their August Tour of Snowdonia. 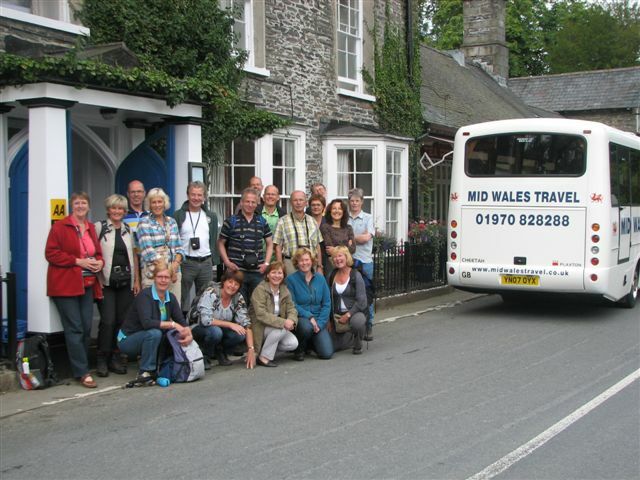 SNP travel throughtout South and Mid Wales every year with Mid Wales Travel. Pictured above at The Hafod Arms Hotel, Devils Bridge. We have kicked off this year with the new addition of the 306 service to Penparcau running twice every hour and 512 service to Borth to run hourly. New timetables can be found above on Public Bus Services.